It’s not a pretty picture. U.S. sales of many of the most popular premium cars are tumbling. Quickly. The Mercedes-Benz C-Class and Audi A4? America’s two most popular small luxury sports sedans? Year-over-year, sales of the Benz and 3-Series are down 15% and 31%, respectively. As for lower-volume competitors, many are suffering the same fate. Set to be refreshed soon, the IS is down 25%, already a 3782-unit loss in just four months. 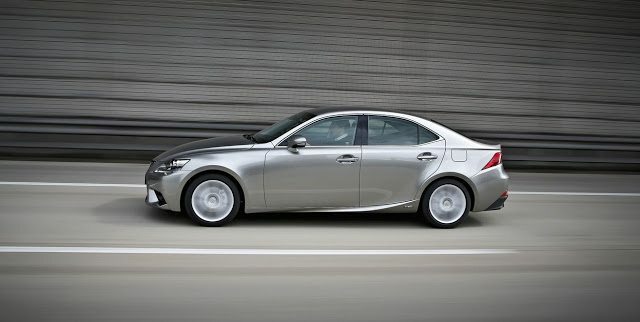 Newer entry-level competitors from Benz and Audi? The CLA-Class and A3 are down 17% and 5%, respectively. 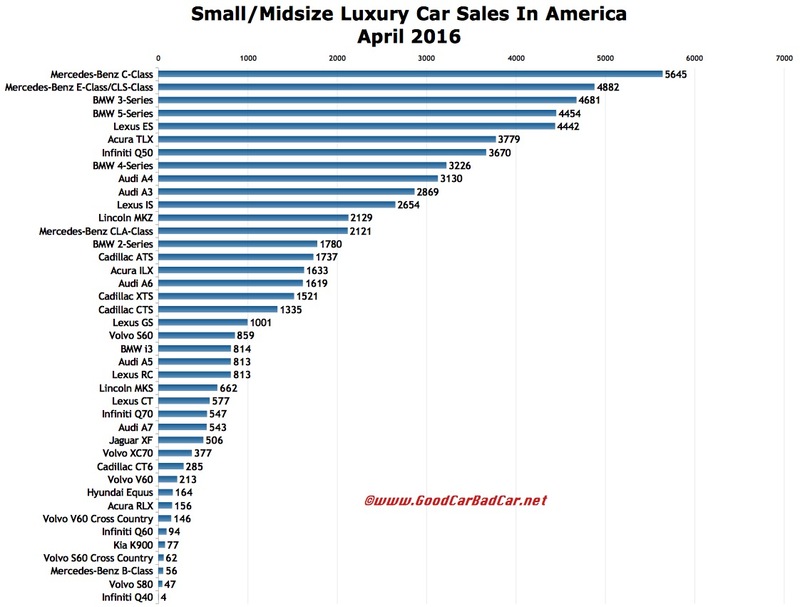 Up a notch in size and price, U.S. sales of the Acura RLX, Audi A6, Cadillac CTS, Infiniti Q70, Lexus GS, and Mercedes-Benz E-Class/CLS-Class – among others – are tanking. Yes, consumers are moving toward SUVs and crossovers. You can click any model name in the tables below to find historical monthly and yearly U.S. auto sales data. You can also select a make and model at GCBC’s Sales Stats page. 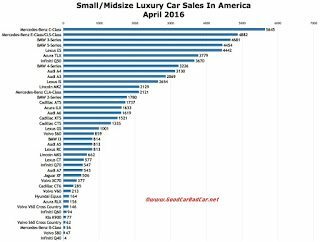 These tables are sortable, so you can rank luxury brand cars any which way you like. Suggestions on how GCBC should break down segments can be passed on through the Contact page. ^ A4 includes Allroad, without which A4 sales were up 28% to 2983 in April; up 19% to 9361 YTD. GCBC isn’t here to break down segments, an impossible task for any group, but to display sales data for the sake of comparison. The more ways sales data can be displayed, the better. This explains why you’ll see the Acura ILX here but also with mainstream cars like the Buick Verano, too, and the Audi A5 is also displayed with coupes and convertibles… because readers have wanted it both ways. Hyundai USA, not GoodCarBadCar, chooses to combine sales figures for the Genesis sedan and Genesis Coupe, forcing us to include the Genesis with volume-brand cars on pricing grounds before we even get to the “brand status” issue. The K900, Equus, CT6, and XTS are here not because of their size but because of their price points, their lack of direct comparability with the Mercedes-Benz S-Class. You can always find the sales results for EVERY vehicle and form your own competitive sets by using the All Vehicle Rankings posts. Previous Auto News For Monday, May 9, 2016 – Is The Honda Ridgeline’s Arrival Perfectly Timed Or Poorly Timed?